Come join the Belden Club for an exclusive tour of the Kirkland Urban project followed by a networking Happy Hour after. 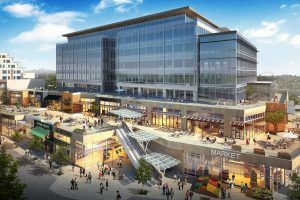 Ryan Companies, in partnership with Talon Private Capital, is redeveloping an existing office park and retail area into a lively, integrated mixed-use center. Set amidst walkable, tree-lined streets, landscaped open spaces, and offices and residences overlooking public plazas, Kirkland Urban provides a wide variety of shopping, dining, entertainment and recreation experiences. The 12-acre development comprises three phases to be built over seven and a half years. 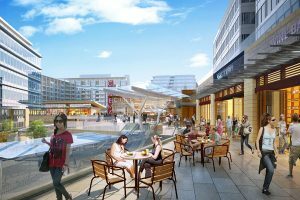 The first phase includes two office buildings, one residential building with 185 apartment units and retail, including a grocery store. 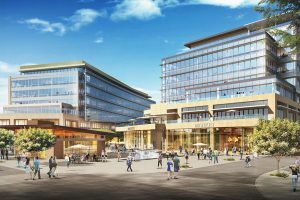 At full build-out, Kirkland Urban will total more than one million square feet and will include restaurants, a movie theater, a fitness club and more than two acres of open public space. 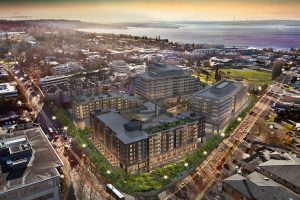 Both a home and a destination, the development incorporates the best of the waterfront community of Kirkland, WA, combining an authentic, neighborhood feel with an urban energy. This reflects and celebrates the evolution of the Kirkland community: balancing the need for growth and economic opportunity without losing touch with the comfortable, small town roots of its past.